Last Chance for Cat Island? With all of the noise surrounding compensation payments made (or not) to people and businesses hurt by the BP / Deepwater Horizon oil and gas disaster, one mostly overlooked casualty of that massive oil spill has been the thin, fragile line of barrier islands that form(ed) the Gulf’s first line of defense against hurricanes, and provide vital habitat for birds and other wildlife. 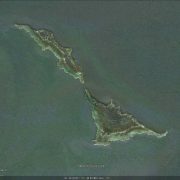 These islands were in trouble before the spill, threatened by rising sea level: the gap between the north and south halves of the island was formed in 2005. But the spill killed vegetation that helped anchor the sand in place, accelerating erosion. Cat Island in 2006. Vibrant vegetation covers both parts of the island. 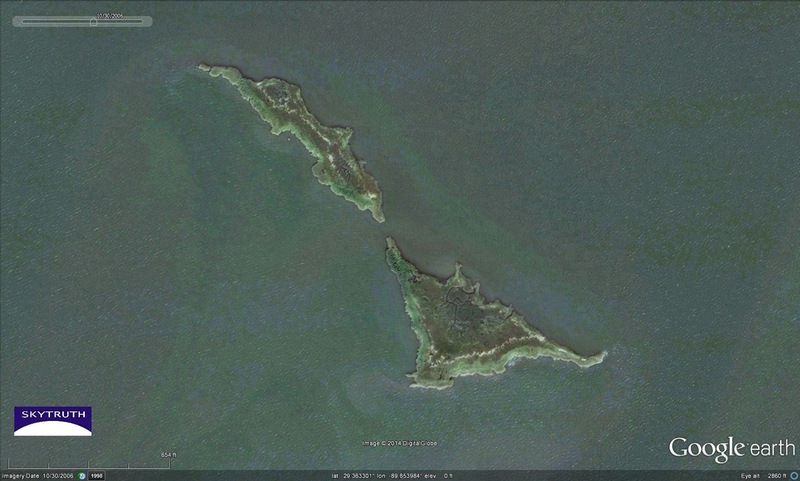 Cat Island in 2010, during the height of the BP oil spill. 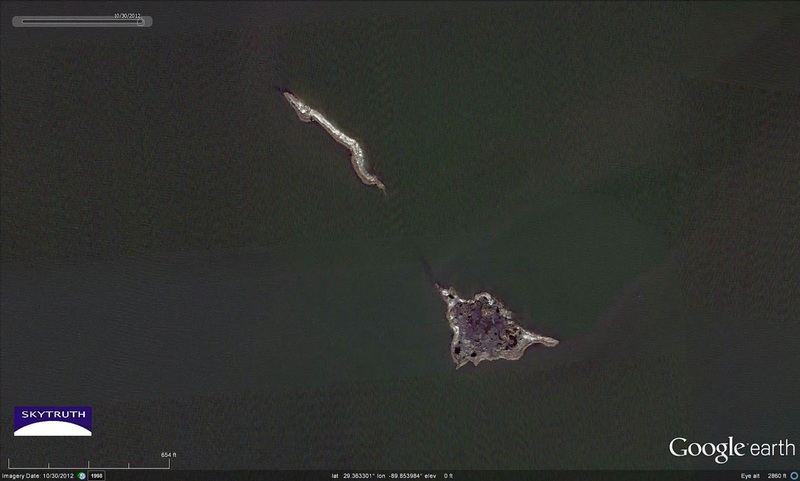 Absorbent booms surround the island in an effort to hold back the oil. A few small slicks (dark streaks) are apparent, possibly oil from the spill. 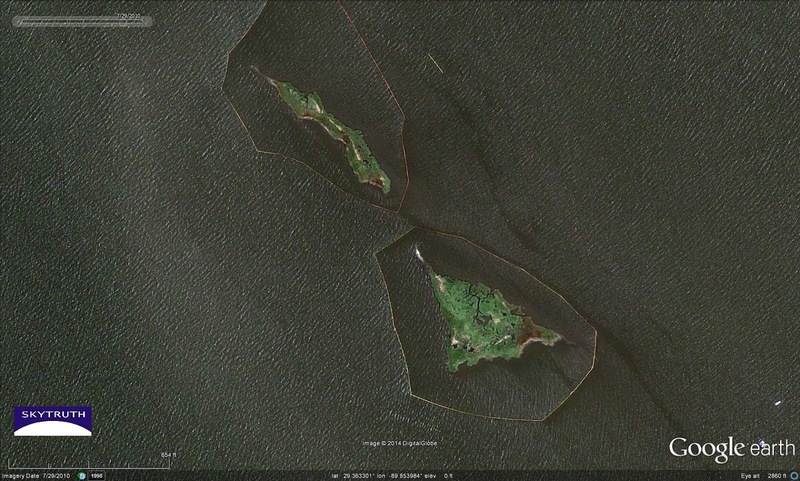 Cat Island in 2012. The once-thriving vegetation appears mostly dead, and the island has shrunk significantly in just two years. Can Cat Island, and the other important Gulf Coast barrier islands, be saved from this precipitous decline? Enter the US Army Corps of Engineers. 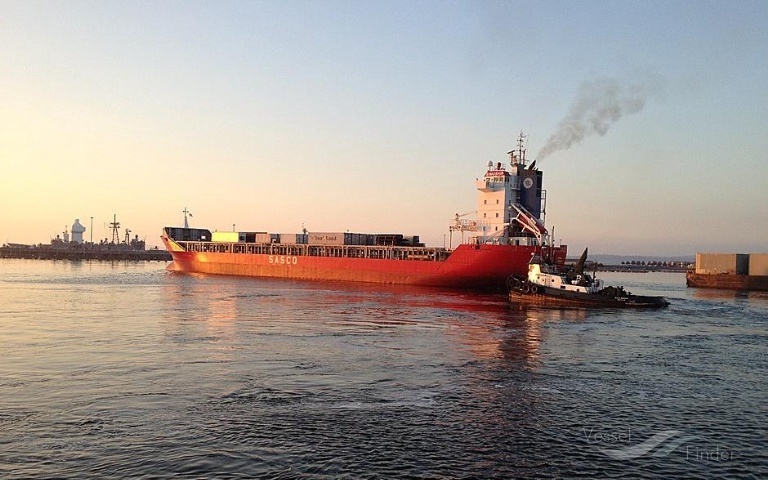 They will attempt to rebuild the island by depositing sediment dredged from the channel of the Mississippi River. 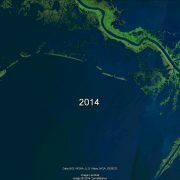 The Corps has a very uneven record where barrier islands are concerned, and the industrial Mississippi River sediments are likely to contain a variety of contaminants — a problem that has dogged other restoration projects in the region — but this may be the last chance for Cat Island. 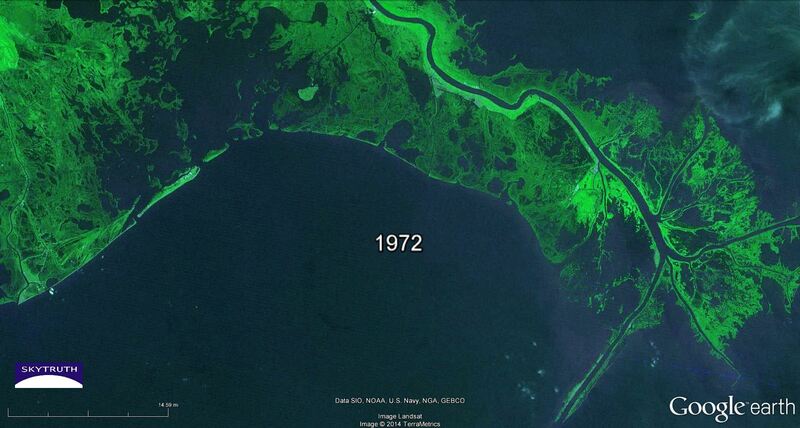 This 30-year timelapse sequence of Landsat satellite imagery vividly illustrates the problem facing Louisiana and the nation. As the barrier islands melt away, the bays and marshes of the Mississippi Delta — hosting a vast, aging network of oil and gas pipelines and other infrastructure — are increasingly exposed to hurricanes and other severe storms. Can we fix this problem in time? 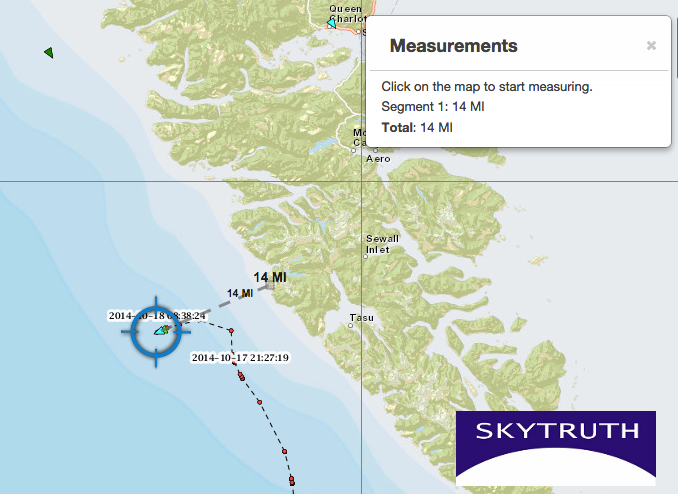 https://skytruth.org/wp-content/uploads/2014/10/SkyTruth-CatBayLA-GE-2006.jpg 961 1600 John Amos /wp-content/uploads/2016/08/test_logo.png John Amos2014-10-27 14:35:002019-02-08 10:11:41Last Chance for Cat Island? Yesterday, SkyTruth Communications Director David Manthos was in Pittsburgh, Pennsylvania talking about “Cartographies of Energy and the Environment” at the Annual Meeting of the North American Cartographic Information Society (NACIS). This year’s conference theme is Cartography and Time, offering a perfect opportunity to cover some of the ways we try to display the passage of time in our maps and images. 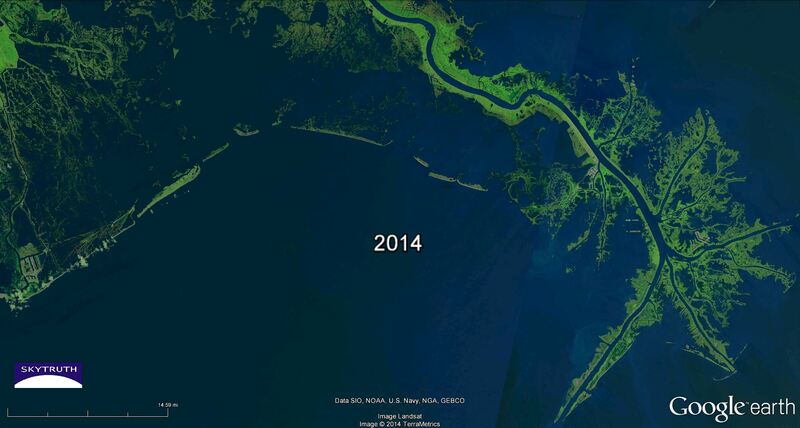 They include this handy tool to let you compare a change over-time (like how much land the Gulf Coast has lost since 1972) just by sliding your mouse back and forth. Or a simple GIF of drilling activity in Pennsylvania, as determined by our FrackFinder projects. Or a flashy animation of all the natural gas flaring around the world, updated nightly with new satellite data from NOAA. We shared the panel with John Cloud, a historian working for NOAA to document how experimental steamships built in Pittsburgh played a major role in surveying U.S. Coastal waters before the Civil War, and Matt Kelso from our friends at the FracTracker Alliance on how shale gas drilling today is transforming the landscape around Pittsburgh and beyond. Thanks to the efforts of several hundred citizen-scientists who participated in our FrackFinder PA projects, we are releasing a map of fluid impoundments that we believe to be associated with drilling and hydraulic fracturing (fracking) in Pennsylvania’s Marcellus Shale. Among other public and environmental health concerns, the shale drilling boom in Pennsylvania has led to construction of hundreds of large ponds and reservoirs to hold the water needed to frack modern shale gas wells, and to contain the “flowback” or “produced water” that returns to the surface laden with toxic and often undisclosed chemicals. Click here or above to explore a full-screen, interactive map: This map displays impoundments related to shale gas drilling and hydraulic fracturing (fracking) in Pennsylvania, as identified by SkyTruth staff and volunteers on USDA aerial survey photography from 2005, 2008, 2010 and 2013. Did we miss an impoundment, or mark a pond that isn’t related to drilling and fracking? 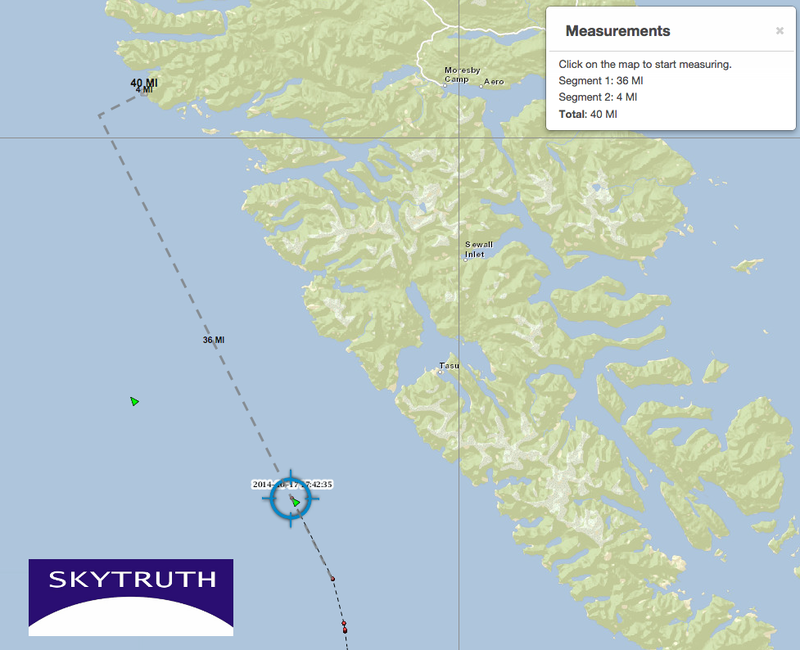 Let us know – info@skytruth.org- and please include as much detail as possible (pictures, GPS coordinates, etc.). These impoundments are of interest to researchers at Johns Hopkins University who are investigating the public health implications of living near drilling and hydraulic fracturing. We couldn’t find any existing public map or dataset that would do the job, so we put together the FrackFinder program and asked for your help. We already knew living next to one of these massive impoundments could be a headache (figuratively, if not literally) because we noticed last year there were ten separate complaints to the National Response Center from five different residential addresses surrounding the 13.5 million gallon Carter Impoundment in Washington County. Since then, our partners at Earthworks published a detailed case study of this site, and Range Resources was recently fined $4.15 million by Pennsylvania’s Dept. of Environmental Protection (DEP) for violations at the Carter Impoundment and five other centralized fluid impoundments in Washington County. The penalty is the largest fine to date assessed against a shale gas driller by PADEP. We also observed that these impoundments are not permanent and may be reclaimed after a few years. Of the 581 ponds we delineated in 2010, only 116 of them were identified again on 2013 imagery. To find these impoundments, we asked volunteers to look at the aerial imagery of locations where drilling permits had been issued, and respond to very simple questions about what they saw on imagery taken in 2005, 2008, 2010 and 2013. But how did we keep well-meaning volunteers from going on a wild-goose chase and incorrectly labeling all the duck ponds in Pennsylvania as possible toxic waste storage facilities? The answer is a lot of work and multiple safeguards to make sure we produce the most accurate result possible; all while engaging the public in the process. In the first phase of the project, Project Tadpole, we showed ten different volunteers locations where a shale gas well had been permitted and asked if they saw a drilling site (“well pad”) and drilling activity at the site. 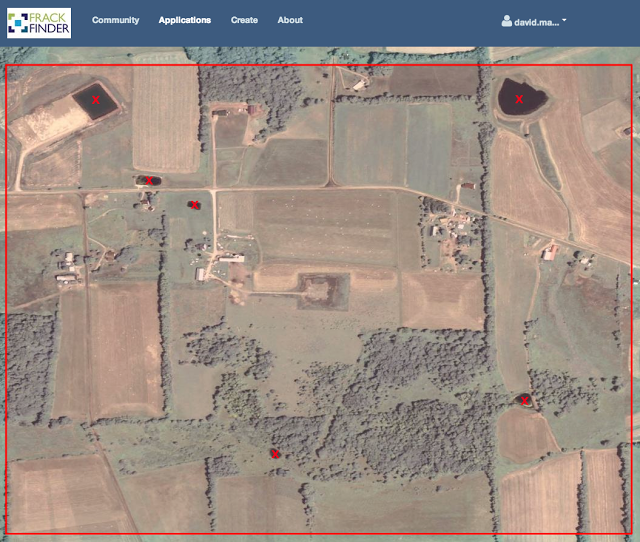 Screenshot from FrackFinder PA – Project Tadpole 2013: Since the crosshairs mark the exact location of a permitted gas well, there is little opportunity to mistake a new house for a well pad. In the second phase, Project Moor Frog, we asked our volunteers to identify anything that looked like a pond within a one square kilometer area of a well pad (the red shaded area in the example below). 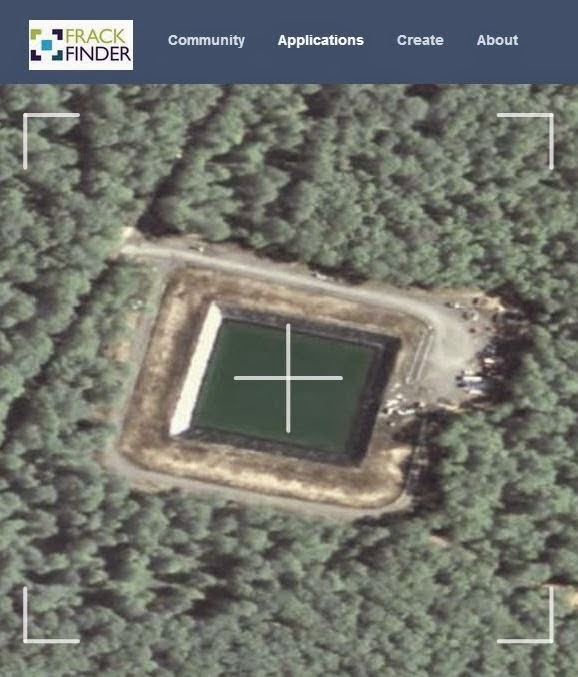 Screenshot from FrackFinder PA – Project Moor Frog: In this phase, volunteers mark anything around the well pad that looks like a pond. We obviously get a few duck ponds in this set, but not to worry, we’re going to check everything two more times before we’re done. For the third and final public phase, Project Dart Frog, we took all the features that people thought looked like ponds (including quite a few duck ponds, shadows, manure lagoons, and other stuff) and showed them to ten different volunteers who had been trained to tell the difference between ordinary farm ponds and the large, recently constructed impoundments we’re interested in. 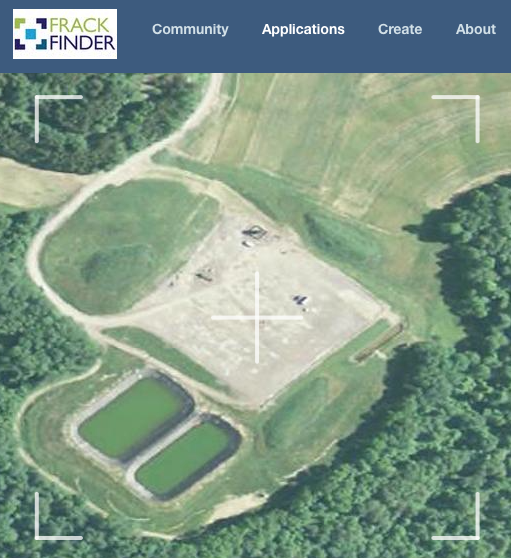 Screenshot from FrackFinder PA – Project Dart Frog: Once we’ve identified ponds in the immediate area around a well pad, >7 of 10 volunteers have to agree that it has the characteristics of a drilling impoundment (straight edges, visible black or white liner, large access roads, etc.). Even this isn’t 100% perfect, but it narrows down the number of a site we need to look at in the final step. Notice how we talked about showing these images to multiple volunteers? We had to have >70% agreement among our volunteers for a site to pass through to the next phase of each of our projects. After each phase of the project, we review the results and check some of the sites for ourselves to make sure we agree with our volunteer’s determination. You can review the findings of our QA/QC here and our full methodology here. Finally, after our volunteers helped us with all those different phases of the FrackFinder project, we asked our GIS analyst Tita to outline all of these impoundments manually. If one of Farmer Brown’s duck ponds somehow managed to get through all those hurdles, we still had this last step to throw out a few lingering sites that obviously didn’t belong. This dataset may not capture every drilling-related impoundment that has ever been built in Pennsylvania, just the ones that appeared on the USDA’s aerial photographic surveys that are taken every 2-3 years. 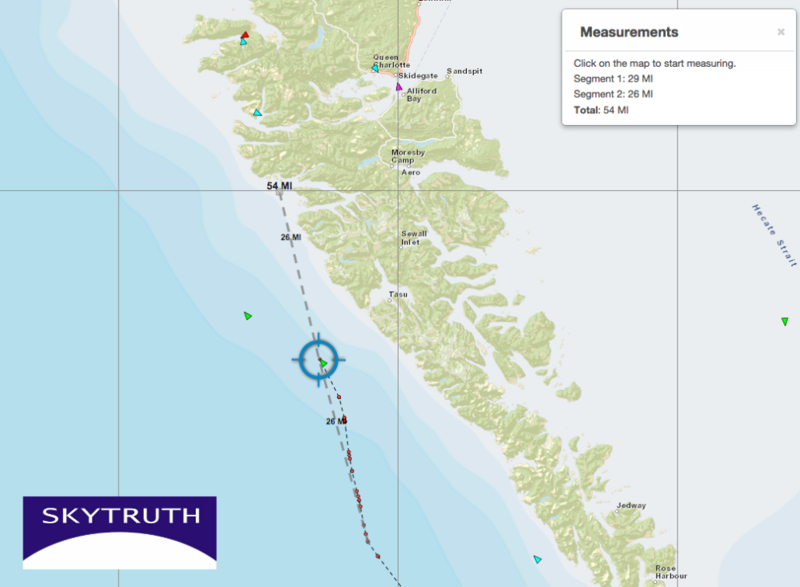 Furthermore, we only outlined impoundments that fit our criteria for proximity to active, permitted drilling locations, and that were identified in multiple project phases by our volunteers and SkyTruth staff. However, since we are only looking at these sites from far above, it is possible that we excluded or missed a few drilling sites and impoundments, or labeled something a drilling-related impoundment when it is just a duck pond. We welcome your feedback to help us make this map as accurate as possible — and we welcome your help with projects like this shortly, as we respond to concerns from citizens in other drilling states like West Virginia and Texas. Contact us – info@skytruth.org – to submit corrections, request access to the data, or sign up to get notified when we launch future projects! 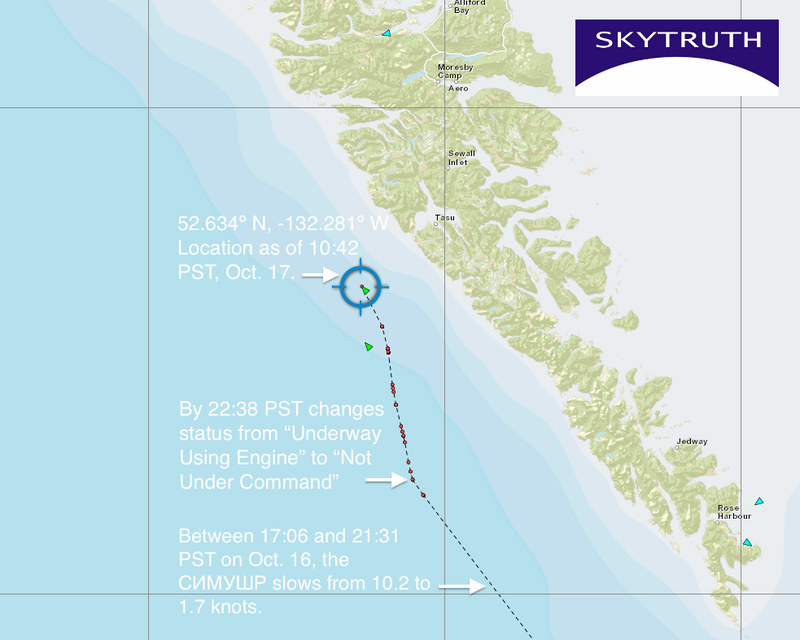 Editors Note: Since Google Maps Engine previously hosting this data has been discontinued by Google, the map data and styling was migrated to a new Carto account in January 2017.